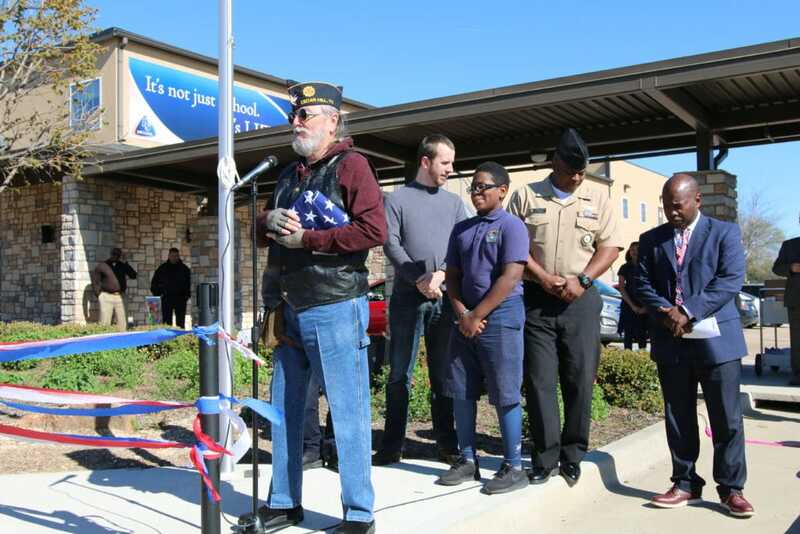 CEDAR HILL—Life School Cedar Hill held its first flag raising ceremony on March 20 at the school’s newly minted flag pole thanks to the help of the American Legion Post 111. American Legion provided all labor and materials for the new flag pole as well as a new set of American and Texas flags. “The American Legion is honored to participate in Life School Cedar Hill’s flag raising ceremony and provide resources to better our children’s welfare,” said American Legion 1st Division Vice Commander Gary Smith, who shared information about the history of the American Legion, its volunteer work, and opportunities the organization offers to students. 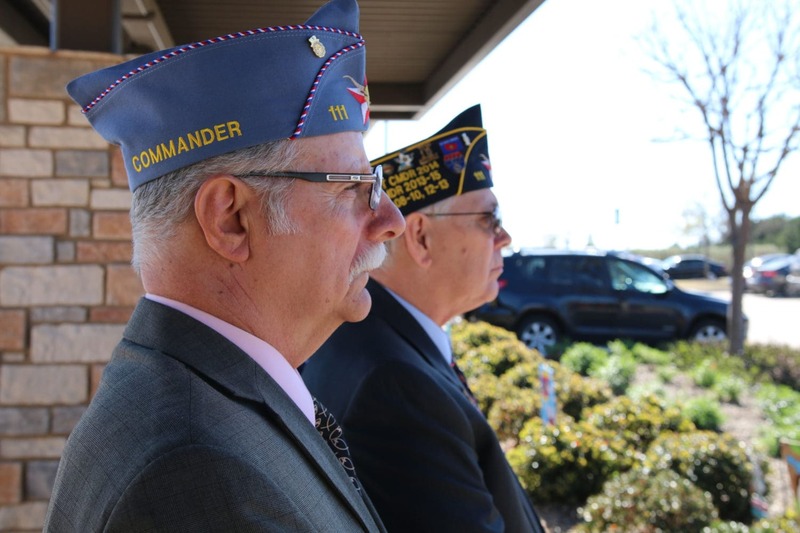 Other American Legion Post 111 members who attended the event included Commander Jan Cloud and Sons of American Legion Squadron 111 Commander Ramon DeMaria. Cedar Hill Mayor Pro Tem Stephen Mason and Cedar Hill City Council members Jami McCain and Daniel Haydin, as well as students, parents and other community members, were also in attendance. Life School Cedar Hill aide Linda Reid and third grade teacher Cyndy Milam teamed up to secure a flag for the elementary. Reid contacted the American Legion Post 111, where her husband is a member, to learn how to get a flag and flagpole for the school. Instead of simply giving her a flag or telling her where to get one, the American Legion board took a vote and supplied the labor, a new flagpole and flags for the school. “The American Legion has a special place in my heart, and I am grateful for how they teach our children how to care for and respect our flag and country,” said Reid. Students were involved in the ceremony as well. Student council officers received and raised the flag with the help of military parents at the school, and the Life School Cedar Hill choir sang My Country, Tis of Thee and The Star-Spangled Banner. Michael Mitchell, Life School Cedar Hill assistant principal and a Navy veteran, explained the meaning of the folds of the American Flag and the meaning of colors on the Texas Flag during the ceremony. Life School opened as an open enrollment, public charter school in 1998 and has campuses in Oak Cliff, West Dallas, Cedar Hill, Lancaster, Red Oak and Waxahachie. For nine consecutive years, Life School has received the Texas Education Agency’s highest rating in School FIRST (Financial Integrity Rating System of Texas), a financial accountability system for charter schools. Life School’s mission is to train leaders with life skills for the 21st century by establishing strong academics, character training and a parenting program.